Ashtimki, the painting that adorns the walls on the day of Krishna Janmasthami, the birthday of Lord Krishna, depicts the Tharus’ version of evolution of life. The painting not only represents an art form, but the Tharu folklore, the oral history handed over from generation to generation. The Ashtmiki is painted on the walls, especially at the house of a Tharu elder called Mahatawa. It is painted by male artists with support from their female counterparts. The girls and women are also learning to paint these days in order to keep the tradition alive. The colours used in the painting are sourced naturally: the red clay, bean leaves, burnt wild grass are used as red, green and black respectively. The Ashtimki is painted in three stages. The artist starts painting from the bottom. Firstly, a water source is drawn and fish are added to it. Then a boat is drawn with the creator Gurbaba and his disciples. It is believed that during apocalypse, the Gurbaba along with his disciples and books sails to a safer haven and creates a new world. Then the artist adds crab, tortoise, crocodile and other water creatures to the water source. According to Tharu folklore, fish evolved first. In the folk epic Gurbabak Jarmauti, the fish is named Raini machharya. According to the epic, the Gurbaba with the help of a crab and earthworm brought Amarmati (clay) from the netherworld and created this world. A kadam tree takes the centre stage on the second part of the painting. On the tree, Lord Krishna is shown playing flute. Kadam is the favourite tree of Krishna, as believed by Tharus. Along with Him, monkeys share the tree. According to Gurbabak Jarmauti, the children of Sidhhapurush resembled monkeys. On the right and top of the water resource, a lily leaf is drawn and near it Baramurwa (twelve headed demon, the Raavana) is added representing the bad and devil. In the middle a palanquin called doli, used during the marriage ceremonies, is sketched. Two palanquin carriers are shown carrying Draupadi, the wife of Pandavas in the doli. Above it five Draupadis are added, in a line. Some Tharus say that the doli represents the marriage of Ram and Sita. And the characters above the doli are Kauravas, the sons of King Dhritarashtra. The third and topmost part of the painting has five Pandavas just above the five Draupadis (or Kauravas). Then sun is added on the top right corner and moon on the top left corner. Beautiful triangular shapes border the rectangular painting. Even elephant, horse, camel, peacock, chicken and trees are added to the painting. The painter fasts till the drawing is complete, while the females worship the painting starting with the Mahatawa’s (Tharu elder) wife. All the characters in the painting are worshipped and a tika, vermillion is applied to them, except the Baramurwa representing the bad and evil. After the worship, they break the fast and eat fruits. Gathering at the Mahatawa’s house, they sing Ahtimkia, the song talking about creation and different religious events, the whole night. In the morning, all the worshipping materials including the oil lamps are submerged in a nearby river. The worshippers wish the end of disease and wounds inflicting them, to be washed away by the water, along with the submerged materials. They then bathe in the river, return to their homes and offer the rice and vegetable curries prepared to fire as prasad, the offering. 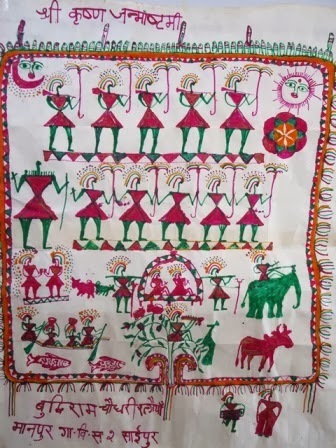 The Ashtimki painting has the potential to compete with Mithila painting, Thanka and Mandala art forms. The stories associated with the painting make it more valuable and sellable in the national and international markets. More research is needed to find further facts about the tradition. Promotion at different events through different media is necessary to popularise the art that talks about the Tharus’ version of evolution of life on earth.